26th at Seventh Avenue, Manhattan, New York, 1980s. 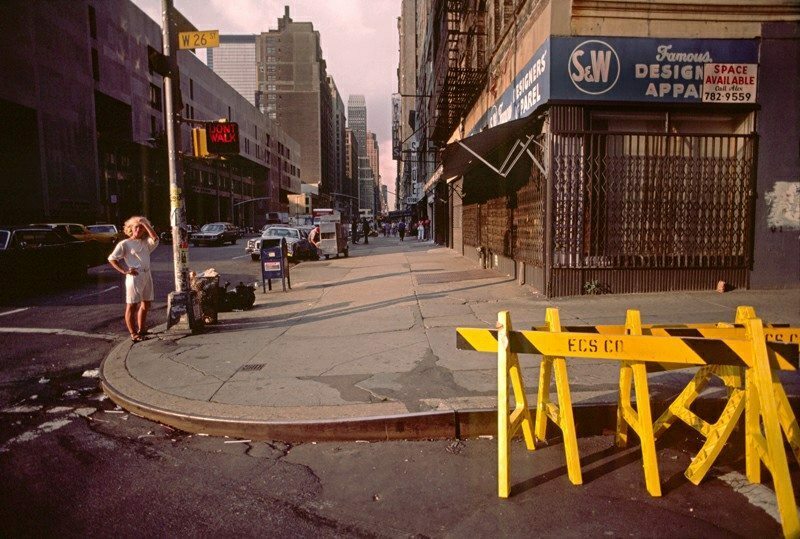 I found the above photograph of West 26th Street and Seventh Avenue in Manhattan, New York from the 1980s (I don't have a better date than that) and wondered what the same corner looked like 40 years later. 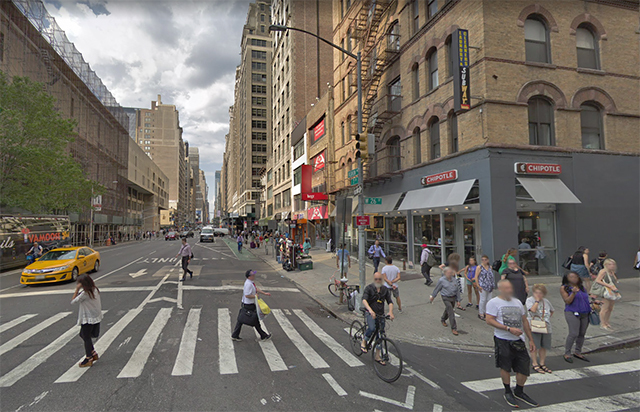 So, I did a comparison of West 26th Street at Seventh Avenue in Manhattan between the 1980s and 2018. The resulting photograph from Google Street View is below. In a sign of the times, the little store on the corner in the 1980s (which apparently was leaving) has been replaced by a Chipotle. Notice that the 1980s store has an iron grating to protect it, which was quite common in the 1980s. It is doubtful that the Chipotle has anything like that. However, the Chipotle's security is built-in, as the plate-glass windows of the 1980s store largely have been replaced with solid walls. The stores of the 1980s generally were built with a more open style featuring expansive windows, and not like the mini-fortresses of today. To be fair, the Chipotle store is very tastefully done, and you can hardly tell that it also is a more secure store now. A lot of New Yorkers these days complain that the focused little stores of yesterday which sold appliances and furniture and things like that are rapidly disappearing. They are being replaced with the Chipotles of the world, small stores featuring high traffic that feature things that you can't really buy online (like a hot tamale). The corner of West 26th Street at Seventh Avenue is a perfect illustration of that trend. The building itself is the same, as are the buildings on the other side of the street all the way into the distance. The streetlamp is in the same place and, who knows, may even be the same one. The postal box is gone, of course, a victim of 9/11 security measures. Really, aside from those details and others like the different crosswalk painting, this view looks almost identical to the one you would have seen in the 1980s. However, the corner undeniably is cleaner in the later photograph, there was a lot more random trash in the gutters in the 1980s and earlier. This is another in my series of "the more things change, the more they stay the same" comparisons. The corner of Seventh Avenue and 26th Street definitely is one where a visitor from the 1980s would feel right at home and would barely notice a difference, though he or she might wonder what that Mexican restaurant on the corner served. West 26th Street at 7th Avenue ca. 2018 (Google Street View).